Good afternoon. I am delighted to join you all here on the Sports for All day for children with special educational needs. Since the enactment of the various anti-discrimination ordinances including disability and race in Hong Kong, and through the zealous efforts of the Equal Opportunities Commission, it is fair to say that public awareness of opportunities for all and social inclusiveness has been raised in society. However, much focus has been put on education, employment, access to medical and health services, and outreaching support. I am glad that this afternoon, we are gathering together to share the fun of sports with children with special educational needs. In my view, sports nurtures courage and resilience, promotes team spirit and removes barriers. I therefore wish to thank Puja for putting together this meaningful event. I agree with her that the opportunity to engage in play and sports is key to good health and should be a fundamental right for everyone, including those with special needs or disabilities. 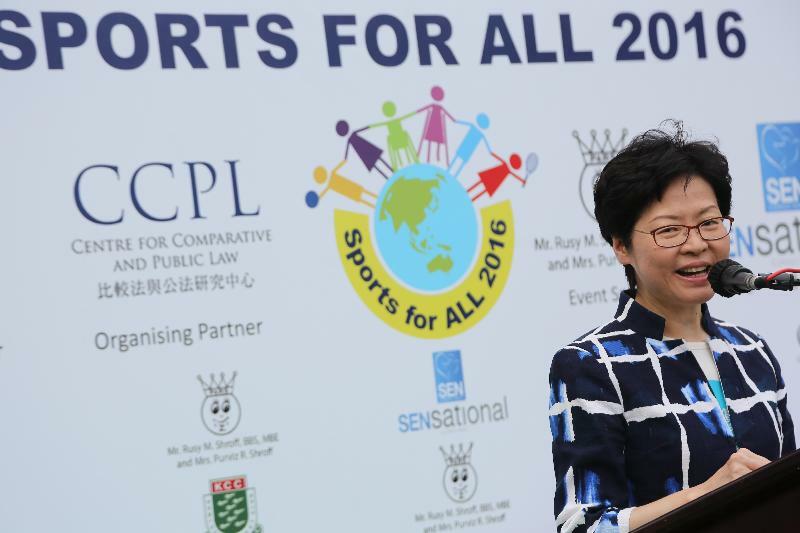 It has always been a policy of the Hong Kong SAR Government to raise public interest in and awareness of sports, encourage wider public participation and promote a healthy lifestyle in the community. A wide variety of recreation and sports programmes are organised throughout the year for people across different age groups and physical abilities. The event held today is surely in line with our policy objective of promoting an inclusive society, where all individuals can enjoy equality and respect in different areas of life." Click here to read the full speech and view photos and a video of the event.